Every Saturday, I have a side job teaching English (as a second language) to a bunch of kids in free community school. For the latest assignment, I split them into groups, assigned a broad prompt to each group, and asked them to pick a specific subject matter and make a presentation based on that. On the presentation day, things went just as I expected. Most of the kids, aged fourteen to nineteen, were shy and lacked both confidence and fluency in English, so I had to help them when they’re stumbling with their material, prod them to ask questions, and continuously assert myself to keep things going and lively. Then, one of the groups revealed that they’re doing a presentation on Doraemon (the prompt I gave them was ‘Japan’), and the class simply exploded. And so on. I basically just sat back and watched in awe as the kids kept asking questions and debating minutiae of Doraemon lore with overwhelming amount of passion and joy. It reminded me of my own times being glued in front of the telly every Sunday morning and devouring every Doraemon story I could found. And I teared up a bit, because it also struck me how this series’ immense charm still resonated with the new generation more than 20 years since the advent of the anime and manga in my country. You see, for countless Indonesian kids and probably so many other in Eastern Asia region, Doraemon is our childhood. It’s a bit hard to articulate what’s so great about Doraemon to the modern fans who may never even heard of it. One may dismiss it as a product of nostalgia, a relic of children anime/manga completely outclassed by the sophisticated narrative and production value of modern works. And that assessment isn’t entirely wrong; it is a product of its era. It’s near impossible to imagine that an adult would just stumble into Doraemon for the first time and decided to stick with it over the course of several hundred episodes, especially in this age where you could access unlimited variety of one-and-done entertainment options. And yet, I still find it worth talking about—especially to the uninitiated–why Doraemon had risen among the ranks of (similarly stellar) Japanese children shows like Maruko-chan, Kobo-chan, and Crayon Shinchan and became such a global cultural icon. Fujiko Fujio got a lot of mileage by pairing up an everychild persona with fantastical high concept (e.g. 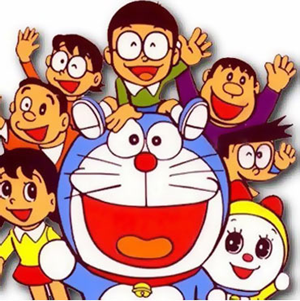 ghost, superhero, ESP, body-swapping alien dolls), but Doraemon is by and far his most enduring creation. Firstly, there’s the simple matter of design. As Hello Kitty had proven, you can really go a long way in terms of mass popularity with a humanoid bipedal cat, and Doraemon went one step further by incorporating something else every kid and adult love: robot. Yet, nothing about Doraemon is hard sci-fi; for all intents and purposes, he’s basically a human(e) character who just happened to have an awesome collection of toys. His personality, even moreso than those toys, is what makes him so great and appealing. As a traveler from the future specifically tasked to help out hapless main character Nobita, he does take the role of a wise mentor, but he’s far from infallible himself. Doraemon could act grumpy and childish, got his heart broken, become a ‘fraidy car with his ironic phobia of mice, and thus in many ways, he’s basically just another kid among Nobita and his gang. That sense of extreme relatability extended to the repertoire of gadgets and their general application within the plot. Even as you’ve got the likes of time machine, magic door to anywhere, and tools that can literally bend reality itself, the episodic plotting of the main series is firmly rooted on universal childlike wishes that transcended cultural boundaries: to get popular, to earn a better grade in school, or to get back at the neighborhood bully. However, in Doraemon, things invariably wouldn’t work out well whenever Nobita gets greedy and selfish with his wishes, delivering a simple but effective recurring message for the impressionable minds. There were fun and wacky hijinks, and then there were that kind of stories. The special kind of stories, the ones that feel like treasures hidden by Fujio to be discovered as his child audience grew up and re-visit their beloved series, maybe with kids of our own. A common misconception about children stories is how it would have absolutely no appeal to the grown-ups, whereas in actuality the best of them tend to have nuggets of content that would hit really hard once you’ve left those innocent times behind. And, among the bits of silly, fantastical, comedy in Doraemon, you can find powerfully melancholic contemplation on self-worth, growing up, and parenting. A friend of mine still tune in every Sunday morning and always stop whatever she’s doing when the theme music starts to play. Another friend has been watching together with his sons. My cousin visited me lately and proceeded to raid what’s left of my Doraemon manga to be read together with his girlfriend. I knew that at least three of my students own a Doraemon t-shirt that they really treasure, and their eyes always lit up like nothing else whenever the name is mentioned. 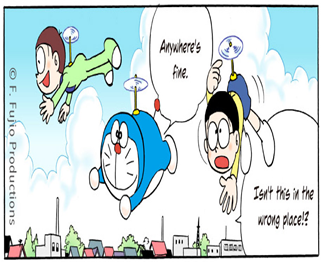 I myself still like to re-visit Doraemon and savor all moments again (time to replenish my manga collection, I think…). There’s that familiar sense of anxiety whenever you’re seeing an old friend, a fear that things wouldn’t feel the same again and you found that they (and you) have changed too much. But, as my recent beautiful moment in the class illustrated, there’s no such worries with Doraemon. We were, are, and will always be in love with him.